On March 7, 2014 a fire destroyed our historic Church. With great determination, perseverance and a great love of God, the parishioners endorsed a plan to rebuild St Anthony's Church. An important part of the plan to rebuild was to preserve the beauty and heritage of the historic Church. On March 19, 2016, Palm Sunday weekend, the "new look" of St. Anthony's Church celebrated the first Mass in the new sanctuary to the delight of many. " In all my years at St. Anthony's, this was the most beautiful day of all" was just one of many comments heard on that day. 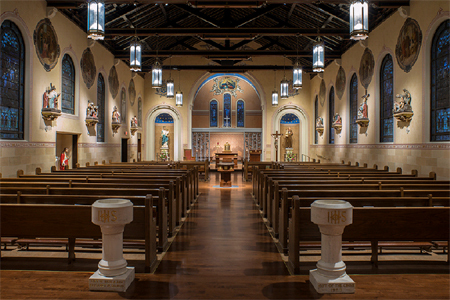 There is a brighter look with a combination of floor finishes featuring hardwood, cork, vinyl, and tile used tastefully in the main body of the church. The walls have been creatively painted creating a brighter and relaxed look for a more peaceful setting. All of the pews have been refinished and configured to best accommodate the needs of parishioners. The Stations of the Cross, a truly unique part of St. Anthony's, have also been refinished as were all of the statues on display. A new Baptismal Font is located in the center Aisle and serves as a symbol of Welcome.